A-shares outperformed most developed markets during 2017. In this update, we review the drivers of 2017 performance, the opportunities and challenges in 2018, and the risks we should be mindful of. Our conclusion? Now that 2017 is nearly over, we’d like to review the China market over the past 12 months and explore what opportunities and risks await us in 2018. 2017 was characterized by an overall increase in risk appetite for equities since the beginning of the year, with positive sentiment eventually spreading from the US to global markets, particularly EM. China’s A-share market is no exception to this, though its rally lagged by a few months. 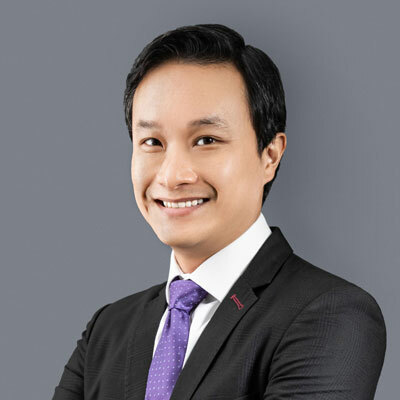 The long-awaited announcement of A-shares inclusion into MSCI Emerging Markets Index was the catalyst that triggered the strong run from mid-2017 to today. Since then, China A-shares managed to outperform most developed markets, including US, Europe and Japan. 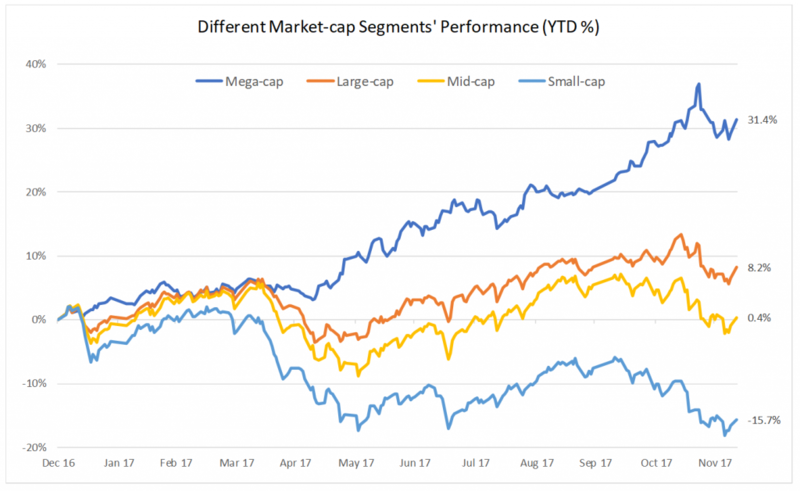 When looking closer at the A-shares market, the diverging performance among mega-caps, large-caps, mid-caps and small-caps is hard to miss. The former two segments had a decent gain whilst the latter two were either flat or loss-making year-to-date. As we have been saying the past 6 months, investors are no longer worried about a potential massive economic slowdown, any one-off depreciation of yuan or uncontrollable capital outflows. This lack of worry explains the positive return recorded among mega-caps and large-caps. On the other hand, some market participants remain cautious as both the International Monetary Fund and local government officials voiced concerns about the Chinese financial system’s vulnerability from high leverage. China’s total debt increased from 164% of GDP a decade ago to today’s 259% of GDP. Economists now estimate the figure may go over 300% by the end of 2020, which may put China in the danger zone for a financial crisis. This limited investors’ all-in risk-taking mindset, resulting in strong security selection bias towards the larger stocks and avoidance of the mid-to-small cap segments so far. Our view differs. We think the debt issue is exaggerated and does not pose any imminent risk. Investors forget that over 60% of the country’s corporate debt belongs to state owned enterprises (SOEs). Government lending to government, left hand to right hand. It is unlikely that the Chinese government would not bail out an SOE if systemic risk issues arose. At the same time, the authorities are pushing SOE reform by developing mixed ownership of SOEs via privatization of state assets and debt-equity swaps, seeking to decrease inefficient leverage in the system. Lastly, investors seem to forget that 259% of GDP is not that big a number when thinking in total debt to GDP terms. The US, for example, is not better. The Federal Reserve estimates that domestic non-financial debt outstanding was $48.6T. GDP is $19.5T. If my math is right, that puts the US at 250% of GDP, and that’s not even considering financial debt. China doesn’t seem that worrisome in comparison. From a sector point of view, Consumer Staples led the market by a large margin, recording a gain of 75.2% year-to-date. 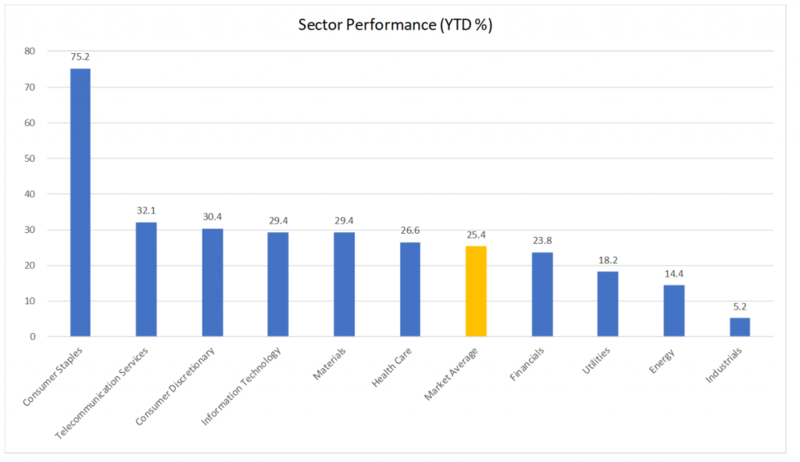 Three new economy-focused sectors, such as Information Technology, Consumer Discretionary, and Healthcare, performed in-line with the market whilst Utilities, Energy and Industrials underperformed. Traditional economy underperformance is not surprising given the rebalancing of China’s economy toward services. The surprise was Consumer Staples’ place atop the leaderboard, likely driven by a policy focus that emphasized “Financial Stability” over “Financial Innovation” throughout the year, forcing investors to prioritize Consumer Staples over new economy sectors. Looking ahead to 2018, we expect most of the positive factors to still be in place for China over the next 12 months. Externally, the global economy has continued its steady recovery, providing a solid foundation for equities. The absence of a GDP target indicates China is shifting from high growth to high quality development, with priorities being given to controlling systemic risk, narrowing the gap between the rich and the poor, promoting regional development, fighting against corruption and protecting the environment. Despite this quality over growth focus, China’s economy will expand by 6.8% in 2017 and 6.4% in 2018 based on consensus data. The growth rate is 3x that of DM, behind only India among the major economies globally (though off a much higher base than India!). 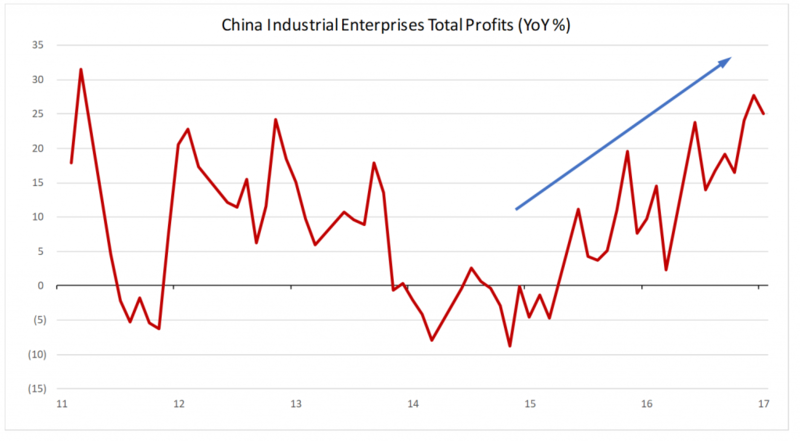 Since bottoming out in mid-2015, China’s industrial enterprise profit continued to rise and reached the highest level in 7 years, underscoring resilience in the economy as authorities intensify their efforts to cut excess capacity and reduce pollution. This gives the government plenty of room to focus on over-supply and deleveraging, while balancing those long-term goals vs short-term pain. Robust producer-price inflation, improving output and consumer spending have been supporting the expansion and will likely keep it on track. It is expected the momentum will carry on in 2018, although the pace of growth may slow down slightly. On corporate earnings front, things look encouraging with earnings growth of 14.8% expected for the year of 2018 versus 10.0% in the US, 12.4% in Japan, and 6.5% in the UK. At a sector level, all China sectors are expected to achieve at least double-digit growth rates, although financials will be the slowest one. Banks’ profit has been in a plateau since 2014 and is unlikely to move materially over the next 12 months. 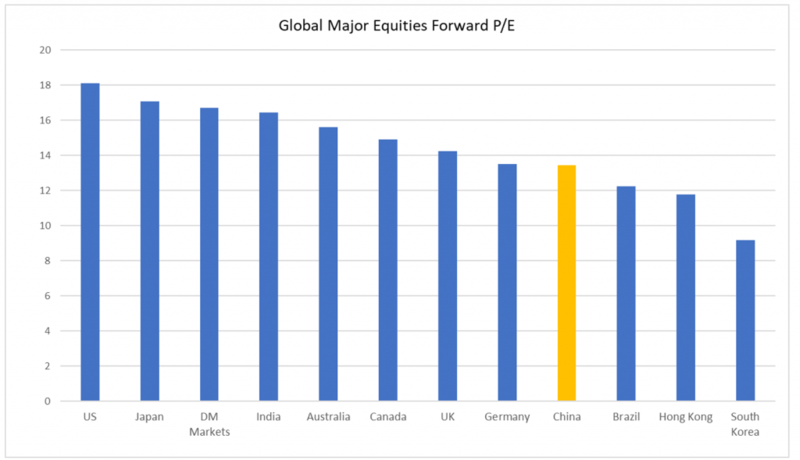 Overall valuations are relatively attractive as forward P/E is only 13.5x versus mid-to-high teens for major developed and emerging equities markets globally like the US, Japan, and India. It is not out of the question that we see an upward re-rating of China A-shares given this healthy growth profile. 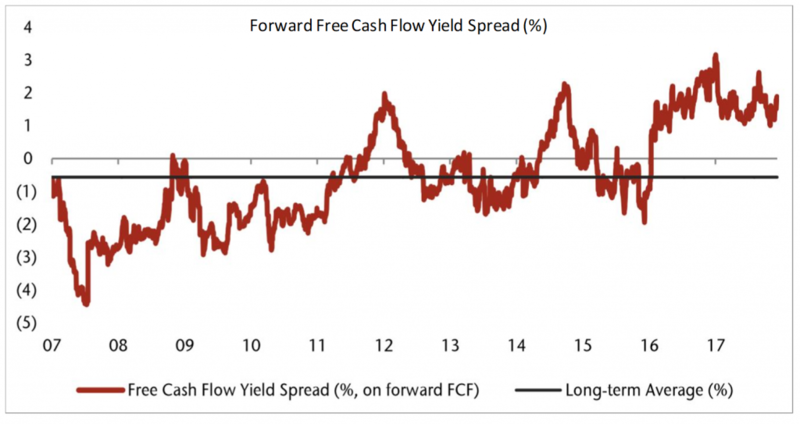 Lastly, the forward free cash flow yield spread between equities and the 10-year government bond yield remains historically high. The last few years have been characterized by bond market inflows and equity market outflows, not just globally but in China as well. The yield advantage of equities may justify a reversal of this trend, driving inflows into equities and making A-shares a very promising exposure for 2018. China’s authorities have been cracking down on “alternative” investment opportunities for retail investors, making A-shares a logical destination going forward. As an example, wealth management product sales are slowing as regulations are tightened. The government earlier cracked down on insurers that were selling wealth management products with guaranteed returns, on concern that their funds were channeled into war chests that funded aggressive acquisition and speculation. Several insurers already had their licenses revoked, or closed. Similarly, financial institutions were ordered to stop promising returns on their products, based on a set of preliminary regulations drafted a month ago by five Chinese regulators overseeing securities, banking, insurance, foreign exchange and the central bank. Traditional equity returns have been good, the number of brokerage accounts is increasing, and retail investors are likely to funnel money into equities in the absence of other alternatives. We would like to make a few predictions for the year of 2018: (1) China A-share will continue to outperform developed markets on solid macro environment and earnings momentum; (2) There will be actual domestic and foreign inflows into equities market, reversing the net outflows in the past couple of years since A-share peaked out in mid-2015; (3) Mid-and-small-caps will record a decent positive return if not outright outperforming large-caps on low valuation and mean reversion. Size is a particularly interesting factor to consider. The gap between mid-small caps and large cap performance is at global financial crisis levels. 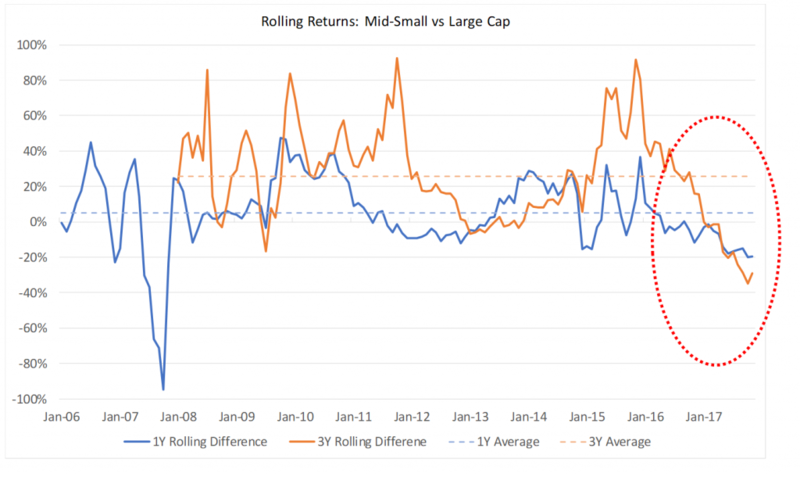 On a 1Y and 3Y rolling basis, mid-small caps typically outperform large-caps by 5% and 25% respectively. Yet today, those gaps stand at -20% and -29%. We believe there is a high probability of mean reversion in mid-small cap vs large cap performance. Mid-small cap is where much of the growth is coming from, and with SOE reform and potentially deleveraging, it is the inefficient large-caps that are likely to pull back relative to private sector mid-small caps. Tightening liquidity will likely influence market sentiment next year. Any excessive liquidity withdrawal will likely challenge the above positive scenario. The potential retirement of long-serving PBO governor Zhou will create uncertainty. The new leadership team will need to earn market confidence. Interest rate hikes in the US can potentially dampen asset prices globally. 2017 showed the Federal Reserve’s ability to move without negative impact but this needs to continue in 2018. Last but certainly not least, the US tax cut on corporate earnings can potentially cause outflows from emerging markets. Both capital repatriation and shifting expansion plans by US firms need to be monitored. We believe these risks are low probably events. We are comforted by the track record of both the Federal Reserve and the Chinese authorities to manage their liquidity withdrawals prudently. China will tighten liquidity if and only if macro-economic growth is strong enough to absorb the impact. Similarly, the Federal Reserve has given us no reason to doubt their methodical and data dependent approach. 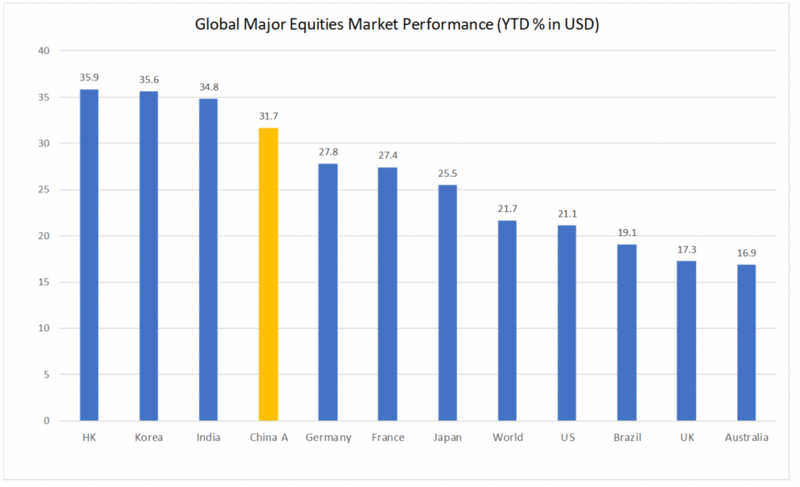 Importantly, should a global market correction occur, we believe Chinese A-shares are the most insulated asset class among global equity markets.